FILE - U.S. Reps. Jahana Hayes, D-CT., left, and IIhan Omar, D-Minn., right, walk together after taking a group photo with other members of the freshman class of Congress on Capitol Hill in Washington. Ilhan Omar is changing the look of Capitol Hill. Omar — one of two lawmakers who will become the first Muslim women ever to serve in the U.S. Congress — wears a headscarf. But her choice of religious head covering is technically banned under the rules of the U.S. House of Representatives. The 116th Congress will be among the most diverse ever. When House Democrats take control of the legislative body this week, they will be changing the rules to reflect that reality. The rule that would have prevented Omar from wearing her headscarf, or hijab, was created 181 years ago, when Congress was a very different place. Women and minorities did not have the opportunity to serve as representatives. When lawmakers decided “every member shall remain uncovered during the sessions of the House,” they were referring to men's common 19th century practice of wearing a hat. The rule was not expressly created to discriminate against religious minorities. But even back then, the rule caused controversy. Some members argued that wearing hats recalled an important custom in the British Parliament symbolizing independence from the monarch. Others argued from a more practical viewpoint, asking where they would be able to leave their hats. But the rule — and its emphasis on proper decorum — prevailed ever since. Hats are just one of many items banned from the House floor. Cigarettes, food, drink and cellphones are all not allowed under House rules. Members of the House do have one advantage over their Senate colleagues — they have always been allowed to bring their children onto the House floor. This is not the first time a member has tried to end the head-covering ban. In 2010, an incoming Democratic House member, Rep. Frederica Wilson of Florida, unsuccessfully lobbied House Speaker John Boehner for an end to the rule. Wilson — who is known for her colorful, often-sequined hats — told the Miami Herald the rule was sexist. “It dates back to when men wore hats, and we know that men don't wear hats indoors. But women wear hats indoors,” she said. 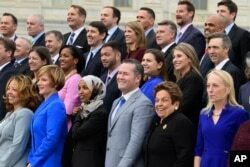 Members of the freshman class of Congress pose for a photo opportunity on Capitol Hill in Washington, Nov. 14, 2018. Head coverings have also been used as a form of protest on the House floor. In 2012, Democratic Rep. Bobby Rush of Illinois was escorted off the floor for wearing a hooded sweatshirt. The so-called “hoodie” was meant to protest the death of Trayvon Martin, a teenager who was shot and killed in Florida by George Zimmerman, a self-appointed neighborhood watch guard. In a tweet, the Somali-born Omar announced she would be seek an end to the ban. “No one puts a scarf on my head but me,” she wrote. Along with Rep. Jim McGovern of Massachusetts and incoming House Speaker Nancy Pelosi of California, Omar is co-authoring a proposal that would allow an exception to the rule for religious or medical headwear. This protection of religious expression would also apply to any members of a range of religious faiths, including Jews who wish to wear yarmulkes or Sikhs who want to wear turbans. The Council on American Islamic Relations (CAIR) applauded the change last November, saying the rule was a violation of the freedoms protected under the First Amendment to the U.S. Constitution. “We support the effort to update this anachronistic policy and to bring the House of Representatives into conformity with the Constitution and its existing protection of religious freedom,” CAIR National Executive Director Nihad Awad said in a statement. The rule would not cover members like Rep. Wilson who choose to wear hats for fashion.